When you ask a little girl what she wants to be when she grows up, you expect answers like an astronaut, a scientist, a teacher, the president, an artist. Motherhood is not the popular portrayal of a glamorous job. Is that reasonable? Can I actually be a full-time wife and mother and professional and do everything perfectly? Tell your little ones how much you love being their mommy with our sweet bedtime story. Motherhood is a real job. The call to motherhood is hard. I’ve talked with so many young women who desire motherhood but fear they cannot afford the financial burden. And I know young women who have obeyed God’s call to motherhood who struggle between the desire to stay home with their babies and the need to keep food on the table. America has changed. It’s no longer set up for single-income, two-parent households. Women on both sides wrestle with the fear and reality of isolation. Somehow we’ve lost the days of Anne of Green Gables, wherein women come together over shelling peas or sewing, and share a wise, humorous, and joyful community. We feel alone and unimportant. Loving and serving is honoring God. Perhaps we should not be surprised that mothers are dishonored in a society which condones the sacrifice of unborn children on the altar of self, but does not honor the sacrifice of self on behalf of God and family. Christ asks us for the daily sacrifice of ourselves to Him. For mothers, this means loving and serving their families as means to honoring God. And God deeply honors and cherishes mothers. Mary was asked to sacrifice her reputation, her honor, her body, and for a time, her country, to carry God’s Son. (Luke 1:28) But she received these and more in her obedience. Her strength of character is expressed as humility, grace, and gentleness. Esther sacrificed her very life for her people, and God gave her courage and humility as strength. Vibia Perpetua, martyred in AD 203, was asked by her own father to renounce her faith for the sake of her infant son. God gave her assurance He would take care of her child that she might glorify Him in the arena. These women loved deeply, and were honored by God for their sacrifice of self. I am incredibly thankful that my own mother sacrificed a career that she loved to stay home and homeschool my sisters and me. And I am thankful for teachers and mentors such as Stacy Farrell, who taught me that intelligence and gracious womanhood and motherhood are not mutually exclusive. However, beware: sacrifice is always required: the world requires it from us, and God requires it from us. The world tells us we can be powerful career women and put 100% of ourselves into a healthy home and family. It’s simply not true, and practically speaking, physically and mathematically impossible. Even carrying a child through pregnancy involves the nine-month sacrifice of a woman’s body. My husband reflected lately that as he gets older, he increasingly realizes that every choice, good or bad, is a choice for something and against something else. For most of our early marriage, we chose not to have internet, because we understood that time answering emails at home after work was a choice against time together. It’s simple logic, but easy to forget, especially in the pressure to be Supermom. Personally, serving my family well right now means that I have to work. But I have committed to finding jobs which enable me to either bring my baby along, or work at home while he is napping. It might look different for you, according to what God has given you and asked from you. First, you are more than “just Mom,” just as you are more than just a brain, or just a body. You are a whole person, with a body, mind, and soul, created in the image of God, and you have dignity as such. God affirms, honors, and desires your whole person. The world would reduce you to mere body, or mere mind. God chose to be born of a woman, and was made flesh, and dwelt among us. Your physical presence and love for your children actually incarnates God’s love to them. Your love for your children matters supremely! If it didn’t, the enemy wouldn’t be trying so hard to dishonor and devalue women, particularly in their role as mothers. that together we can be women honored in our sacrifices for what is most important. A study of beauty in the Bible unearths a staggering fact: throughout Scripture, God uses beauty to express His presence in the world. Woman was made to be beautiful — the crown of creation. When we live fully within our identities as whole women, mind, body, and soul, acting out of the love God gives us, we become our most beautiful selves, and actually communicate God’s presence to our families and all those around us. We’re delighted to share this post from Allison, a homeschool graduate, wife, mother, and one of Stacy Farrell’s former writing students. 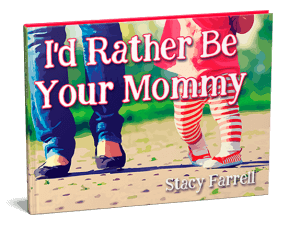 It’s a great complement to our children’s bedtime storybook, I’d Rather Be Your Mommy.